As the optical properties of automotive finishes become more complex, new photonic technologies are being considered as a solution. Some people like bright colors and high gloss on their cars for the appearance of cleanliness and newness. As a result, US automakers have used metallic paints for more than 50 years, enhancing gloss by incorporating tiny mirrorlike flakes of aluminum. In the 1980s, manufacturers introduced pearlescent paints based on naturally occurring mica that highlight the contours of a car and make dirt less apparent. Further improvements in the technology of such special-effect paints include glitter and iridescent pigments whose colors depend on the angle of illumination and observation. These “gonio-apparent” coatings make interesting demands on the instrumentation meant to measure their color. When a car is repaired and repainted after an accident, the repair should match the rest of the vehicle, in both color and texture. But paints can fade over time with exposure to the elements, so it may not be possible to match the color by simply referring to the original paint formulation. Many technicians work by eye, making small adjustments to the original formulation so that the new finish looks like the matured color on the rest of the vehicle. Others use color-measuring instruments to ensure good results, such as by assessing the amount of “orange peel” textural effect from the painting spray gun and by suggesting changes in air pressure to achieve a proper texture match. Auto manufacturers similarly must address color measurement. Photonics also gives them the tools to compare colors and textures that the eye alone cannot judge. Here, too, instrumentation for measuring orange peel is mature and well-established in the automotive industry and often is integrated into the production process. Perceptron of Plymouth, Mich., specializes in noncontact instrumentation, such as its AutoSpect system, which measures gloss, the distinctness of a reflected image and orange peel, and then calculates an overall surface quality rating to correlate with human perception. The sensor comprises a camera and an eye-safe, visible-wavelength LED, which examines a 100 × 150-mm area (Figure 1). Figure 1. Perceptron’s AutoSpect system projects a stripe of light onto the surface of the paint to measure its gloss, the distinctness of reflected image and the orange peel effect. The gloss algorithm measures the light intensity profile of an image at the specular reflection angle. The algorithm for distinctness of reflected image measures how closely a reflected image corresponds to the original. The orange peel algorithm measures surface texture by assessing the waviness of the edge of a stripe of light projected onto a painted surface. The system sends data to a computer through a plug-and-play interface and is integrated into a production line using a line encoder and limit switches to provide information on vehicle position and to trigger the measurement cycle (Figure 2). Figure 2. 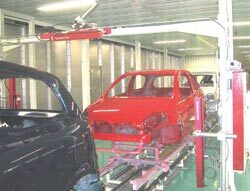 Horizontal and vertical AutoSpect sensors monitor paint quality on every car during manufacture. Although the automotive industry has established standards for gloss measurements, it does not for orange peel. AutoSpect’s orange peel scale, however, is well-known in the US and Japan, and Toyota uses the system in France and Canada. Two products from BYK-Gardner USA of Columbia, Md., also monitor the orange peel effect. 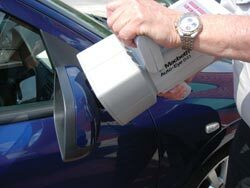 Its wave-scan Plus DOI measures distinctness of image and orange peel on car bodies, and it can cope with gentle curvatures 1 m in radius or larger. Its new micro-wave-scan can handle tighter curves (300 mm in radius) and smaller samples (25 × 40 mm), so it can check the quality of paint on bumpers, mirror housings and door handles. The light source is a Class 2 laser diode, with an output power of less than 1 mW. Standard sensors can measure texture only after the final coat of glossy paint has been applied, so if they find texture problems in the underlying layers, workers must sand back to the problem — in some cases, all the way to bare metal. A new software algorithm from Perceptron measures orange peel on electrocoat (“e-coat”) and primer surfaces, which are relatively dull. This should enable distributed measurement at key steps in the paint process. BYK-Gardner also recently introduced its micro-gloss S instruments for automotive interiors, which measure the color of leather, plastic and fabric components. The company has developed matte calibration standards and a patented calibration procedure to offer high repeatability on low-gloss materials. Conventional paint absorbs and scatters light, reflecting a broad range of wavelengths over a wide range of angles. The result is that the surface appears more or less the same color at all angles of illumination and observation. Traditional color-measuring instruments, therefore, sample the light reflected at just one angle; for example, the 45° illumination, 0° viewing geometry of GretagMacbeth’s Spectrolino portable spectrophotometer (Figure 3). Alternatively, they may illuminate a surface at all angles by means of an integrating sphere and measure the reflected light near the surface normal. An example of this type of instrument is GretagMacbeth’s ColorEye XTS diffuse/8° benchtop spectrophotometer. Figure 3. The Spectrolino from GretagMacbeth AG is a traditional color-measuring instrument with a 45° illumination and 0° observation geometry, suitable for measuring conventional paint or printing inks. The complex optical characteristics of gonio-apparent finishes, however, present challenges to measurement. Metallic paints exhibit what is known as the “flop” effect, as mirrorlike aluminum flakes reflect light intensely at the gloss or “specular” angle, but much less so at other angles. In pearlescent paints, tiny plates of titanium-oxide-coated mica present mirrorlike reflections as well as interference-based structural color. Specifically, the light encounters four changes in refractive index in the pearlescent paint: at the surface of the coating, at the surface of the mica, at the back surface of the mica and at the back surface of the coating as it leaves. At a specific angle, the light rays reflected at each interface interfere to enhance the intensity of one narrow wavelength — the so-called “interference” color that produces a “color flop” effect. The situation becomes more complex as a pearlescent pigment is used with a conventional pigment of a different color to produce a two-tone effect, or as black or white undercoats are added to create other effects. Figure 4. The Pearl design tool from Integra Inc. simulates the appearance of a vehicle as if it were coated with real paint under specified lighting and environmental conditions. Courtesy of Integra. 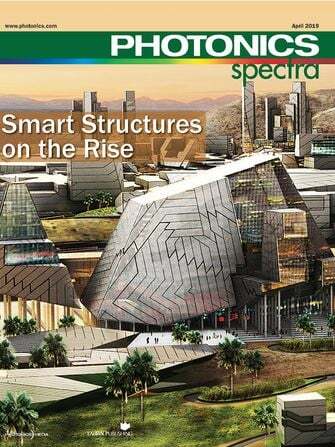 Second-generation pearlescent pigments improve the mica technology by using crystals of silica or alumina and coating them with controlled-thickness layers of inorganic oxides. Companies such as BASF Corp. of Mount Olive and Merck & Co. Inc. of Whitehouse Station, both in New Jersey, are making these pigments with dramatic color effects. Pearlescent paint can highlight the particular styling contours of a vehicle, so paint, additives and undercoat choices are specific to a given model or body style. Integra Inc. of Bunkyo, Japan, makes a computer-based tool called Pearl to assist automobile designers choose the appropriate treatment (Figure 4). 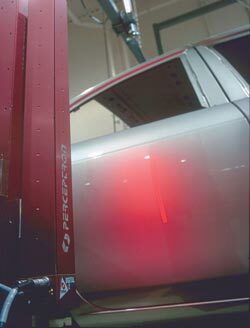 Pearl simulates the appearance of a vehicle in real conditions by superimposing a chosen, quantified surface treatment on the geometry of the vehicle’s body, accurately rendering color changes and highlights under a variety of lighting conditions using a skylight library that includes different locations, degree of cloud cover and time of day (Figure 5). Figure 5. In this sequence, images in high dynamic range format were used for scene illumination, and the virtual Volkswagen Polo hatchback in each case was rendered in Pearl as if it were painted using pigments measured from real-world samples. Courtesy of Integra, Spheron VR AG, Merck KGaA and Volkswagen AG. Integra suggests that the product improves communication between the designer and the manufacturer of the coating materials, and the rendered images can be used in marketing brochures before a prototype has been produced. Because the color of metallic and pearlescent paints depends on the angle of illumination and the angle of view, goniospectrophotometers are the ideal measurement instruments to quantify these surface treatments. They make it possible to plot the rate of color change with angle, which may be an appropriate way to characterize gonio-apparent paints. • Instrument Systems GmbH of Munich, Germany, markets the GON 360, which features angles from –7° to 187° and independent adjustment of the illumination and observation optics. Its wavelength range of 190 to 2300 nm covers the UV-VIS-IR. • Murakami Color Research Laboratory Co. Ltd. in Chuo, Japan, makes the GCMS-3B, which includes software for automatic control by a personal computer. It produces reflection measurements at 10-nm intervals from 390 to 730 nm. • The Optical Radiation Measurement group at the National Physical Laboratory in Teddington, UK, employs a goniospectrophotometer as one of its standard instruments. Constructed by The Tintometer Ltd. of Salisbury, UK, the device uses a diffraction grating to separate the reflected light into 4-nm bandwidths, and it measures the full spectral range from 380 to 780 nm at once. The light source is fixed, but a triple stage can tilt or rotate the sample to any angle relative to the incident light. A circular track allows the detector to move to angles between –75° and 75° to measure the reflected light. The high-torque harmonic drive motors give excellent angular resolution and stability and accuracy of better than 0.1°. Ideally, the measurement samples for this instrument should be flat or have a very shallow curvature. The high cost and relative scarcity of the devices have quality-assurance professionals seeking multi-angle alternatives that offer more information than traditional, single-angle instruments but perhaps less than the true goniospectrophotometers. However, even should an alternative be discovered, challenges remain to the measurement of metallic, pearlescent and gonio-apparent paints. A problem with multiangle instruments, however, is the huge amount of information they generate. “There is as yet no standard method of processing the data or of achieving correlation between the instrumental measurements and the color effects perceived by the human eye,” Gilchrist said. • Konica Minolta Business Solutions USA Inc. of Ramsey, N.J., makes the CM-512m3 spectrophotometer for the measurement of metallic colors. It illuminates a painted surface at angles of 25°, 45° and 75° to the normal, and observes at a fixed 0° angle. The portable instrument measures the surface temperature at the same time as the color, because many paints change color with temperature, an effect called thermochromism. • X-Rite Inc. of Grandville, Mich., offers the MA68II multiangle spectrophotometer. The device has a fixed angle of illumination at 45° to the surface normal and five angles of observation: Relative to the angle of specular reflection and moving toward the angle of incidence, the viewing angles are 15°, 25°, 45°, 75° and 110°. 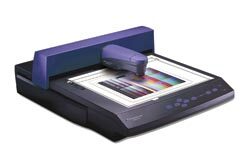 • Standox GmbH of Wuppertal, Germany, produces a five-angle spectrophotometer called Genius+ to measure the color of metallic and pearlescent paints. 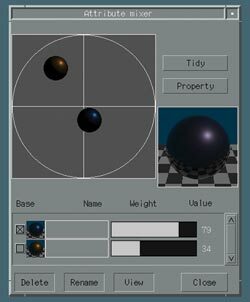 Software assists in the selection of matching paint formulations. • GretagMacbeth AG of Regensdorf, Switzerland, and New Windsor, N.Y., makes a series of instruments with fixed 45° illumination and four angles of observation. The Auto-Eye 640 measures light reflected at 15° to the specular, and at 45°, 75° and 110°, and the 641 uses 20° in place of 15° (Figure 6). The 642 uses 25°. These portable multiangle spectrophotometers cope with slightly curved surfaces by means of a large aperture (the 642 illuminates a 14-mm-diameter circle) and three contact sensors that ensure that the instrument is normal to the surface at the center of the sensors. The device is primed for measurement when all the sensors make contact. Figure 6. GretagMacbeth’s Auto-Eye 641 ensures that a car’s mirrors are the same color as its body. • Datacolor of Lawrenceville, N.J., offers a meter with 10 sets of illumination and viewing geometries. The Datacolor FX10 measures the light reflected at 10-nm intervals through the visible spectrum and has bi-directional measurement geometry. Portable multiangle instruments are generally used as a backup to check and characterize problems that people can see during production. Benchtop devices may be used in quality-control laboratories to monitor a sample of the production; even portable color-measuring instruments are not used for 100 percent inspection, and they are not integrated into the production line. The CarFlash robot-mounted color-measuring instrument from X-Rite, however, is designed for factory integration and 100 percent inspection (Figure 7). It positions the measuring device at a consistent distance and orientation relative to the curved surfaces of the vehicles. It integrates the measurement of color, surface temperature and orange peel effect, with the same geometry as the MA68II, and measures wavelengths from 400 to 700 nm at 10-nm resolution. Designed to make the measurement of curved surfaces much less labor-intensive and more objective, it eliminates the human errors associated with handheld devices. Figure 7. X-Rite Inc.’s robot-mounted CarFlash automatically positions itself at the correct distance and angle from the surface,and incorporates a multiangle spectrophotometer, orange peel instrument and surface-temperature sensor. CarFlash consists of a measuring head that can be mounted on any robot arm that can carry 15 kg with a positioning accuracy of 0.1 mm or 0.1°. An interface box in the measuring head connects to the robot through an Interbus S or Profibus field bus. To set up the procedure for a particular type of car, the user programs the robot with the positions to be inspected, specifying points about 100 mm from the paint surface. During inspection, the robot moves the measuring head to these points; ultrasonic and infrared sensors within the head steer the robot to the exact measuring position and orientation. The device can measure flat, convex or concave surfaces. To measure the texture of the paint, an integrated orange peel system projects an infrared light pattern onto the surface and uses digital frame processing to analyze the result. The head also measures surface temperatures between 15 and 35 °C with a resolution of 0.1 °C. The control software, which runs on Windows 2000 or NT, allows the user to make single measurements offline, and carries out the colorimetric and orange peel analyses. In the normal mode of operation, it feeds these results plus the surface temperature and robot positioning data to a file that can be accessed by the host system for evaluation and monitoring. By communicating with the process control system, it labels the measurements with the appropriate identification data for the car body. 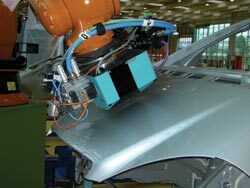 A typical CarFlash inspection system includes two robots, one on each side, inspecting every car that passes on the production line. The system is installed on Mercedes-Benz A-Class and BMW 1 series production lines in Germany and in a Toyota plant in the US. “We now have the tools we were missing to more accurately capture our color harmony position, from a random sample to an up-to-the-minute trend analysis,” said Rick Morgan, the project team leader of Toyota Motor Manufacturing Ky. Inc. of Georgetown, Ky. “This prevents inferior quality from reaching our customer.